A United Launch Alliance Atlas 5 rocket blasted off from Cape Canaveral Wednesday and boosted a $245 million Air Force navigation satellite into space, the first step toward an operational orbit and a welcome development after another rocket, also powered by Russian first-stage engines, exploded seconds after launch from Virginia Tuesday. 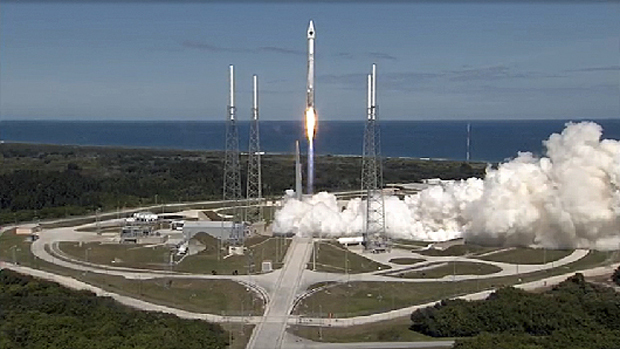 The Atlas 5 mission got underway at 1:21 p.m. EDT (GMT-4) when the rocket's Russian-built RD-180 main engine roared to life with a torrent of flame, generating 860,000 pounds of thrust. After computer checks verified engine performance, the rocket was released from its firing stand and the 19-story booster climbed away from the Cape Canaveral Air Force Station. The initial moments of the ascent appeared to go smoothly as the rocket arced away to the east above the Atlantic Ocean, rapidly accelerating as it consumed its first stage load of liquid oxygen and kerosene fuel. The RD-180 shut down as expected about four minutes after liftoff. Seconds later, the spent first stage fell away and the Centaur second stage's hydrogen-fueled Aerojet Rocketdyne RL10A engine ignited and throttled up to full thrust. The second stage engine, generating 22,300 pounds of push, burned for about 12 minutes and 50 seconds before shutting down to complete the initial climb out of the atmosphere. A second Centaur firing was planned three hours after launch to put the GPS 2F-8 satellite in the proper 12,500-mile-high orbit. The satellite was expected to be released to fly on its own about 24 minutes later. The picture-perfect launching stood in stark contrast to the spectacular failure of an Orbital Sciences Antares rocket seconds after liftoff Tuesday on a mission to boost a space station cargo craft into orbit. The Antares was destroyed about 15 seconds after liftoff by a failure of some sort at the base of the rocket. Two Soviet-era engines are used in the Antares first stage, along with Russian-supplied tanks and plumbing. The engines were extensively refurbished and modernized by Aerojet Rocketdyne and extensively tested before launch. It is not yet known whether one of the engines malfunctioned or whether some other system triggered the rocket's destruction. The RD-180 is a much more powerful engine, chalking up 50 successful launches in a row including Wednesday's flight. But the use of Russian propulsion technology in U.S. rockets that launch high-priority national security payloads has generated concern in some quarters as tensions between the United States and Russia have escalated in the wake of the crisis in Ukraine. ULA recently announced plans to work with Blue Origin, a company owned by Amazon-founder Jeff Bezos, to build a replacement engine for the Atlas 5 and Aerojet Rocketdyne has proposed another variant that could be built in the same timeframe. But a new engine is years away from flying and until then, the Atlas 5 will continue to rely on the RD-180 to boost it out of the dense lower atmosphere. The GPS satellite launched Wednesday is the eighth of 12 state-of-the-art "block 2" navigation satellites built by Boeing that provide ultra precise position, elevation and velocity data using improved on-board atomic clocks that are twice as accurate as earlier versions. The new satellites also feature improved anti-jamming technology, along with a civilian "L5" signal for use by commercial aviation and to aid search and rescue operations. "The improved capabilities of the GPS 2F satellite continues the legacy of delivering global positioning, navigation and timing services," Col. Bill Cooley, director of the Air Force's Global Positioning System Directorate, said in a pre-launch briefing. "We have a legacy to be very proud of, and we will continue to live up to our commitments by sustaining and enhancing GPS mission capabilities to ensure we continue to deliver a healthy, stable and robust GPS constellation for users around the world." The first block 2F GPS satellite was launched in 2010. The three most recent -- GPS 2F-5, 6 and 7 -- were launched in February, May and August, the first two by ULA Delta 4 rockets and the third by an Atlas 5. Cooley said the rapid-fire pace represents "the highest GPS launch tempo in over 20 years." The four GPS satellites awaiting launch will go up in 2015 and 2016. The spacecraft are operated by the 50th Space Wing at Schriever Air Force Base, Colo.
"GPS is a system of satellites, ground stations and user equipment that produce the signals needed to enable positioning navigation and timing services to users worldwide," Cooley told reporters before the August launch. "The GPS constellation is healthy, robust and more capable than it has ever been in GPS history." The Global Positioning System is built around a constellation of at least two dozen satellites in 12,500-mile-high orbits that circle the globe in six orbital planes. At least four GPS satellites are always above a user's horizon as viewed from any point on the Earth's surface. "The satellites continuously transmit digital radio signals pertaining to the exact time (using atomic clocks) and exact location of the satellites," ULA said in a mission brochure. "With the proper equipment, users can receive these signals to calculate time, location and velocity. The signals are so accurate that time can be measured to within a millionth of a second, velocity within a fraction of a mile per hour and location to within feet."